How do I protect my internet business idea? 1. Copyright law can be used to protect the "look and feel" of a website. The "look and feel" of a website consists of a combination of its color schemes, fonts, layouts, etc... To the extent that these are sufficiently original, a copyright registration (or even a common law copyright) could be used to prevent others from publishing similar looking websites. 2. Trademark law can be used to protect the name under which you do your business. Trademark registration is probably one of the most effective ways of protecting an internet business. A valid trademark registration allows its owner to prevent others from doing similar business or providing a similar service under a "confusingly similar" trade name. The confusing similarity standard of trademark law is fairly broad, including misspellings, phonetic equivalents, etc... Above all, in the internet context, ownership of a valid trademark allows the owner to utilize the U.S. Anticybersquatting Protection Act or the Uniform Domain Name Dispute Resolution system to prevent bad faith competitors from registering similar domain names and even to have those domain names transferred to the rightful trademark owner. 3. Patent law can, in very rare cases when it comes to websites, protect the idea behind a product. Patent law can be used to protect ideas that pass the tests of novelty and nonobviousness. Unfortunately, in the internet context, it is highly unlikely that your business idea is sufficiently novel or nonobvious to warrant patent protection. For example, Facebook does not own the monopoly on social networking websites (the idea itself is not novel), Facebook is simply the biggest of its kind because it was one of the earliest and one of the best at what it did. That said, it never hurts to consult with a patent attorney about whether or not your internet-based idea could pass the relevant tests to achieve patentability. 4. 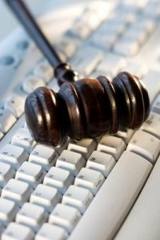 Trade secrets law is one of the most effective tools to protect new internet business ideas. While trademark and copyright law can be used, to an extent, to protect the business once it goes live, trade secrets law can be used to protect the business idea while dealing with employees, consultants, investors and a host of other third-parties who contribute to the eventual launch of the internet business. This is generally accomplished with a well-drafted confidentiality or non-disclosure agreement. A trade secret is, in the most general sense, information developed and used by a person or business to effectively run the business. Examples of trade secrets include client lists, marketing methodology, inventions, prototypes, implementation ideas, etc... The key for information to receive legal classification as a trade secret is that it is not obvious or easily available from public sources (e.g., the internet, Yellowpages, etc...). A confidentiality agreement, or non-disclosure agreement, is a contract where one of the third-parties listed above promises not to disclose any trade secrets provided to him by the business creator about the business. From a practical standpoint, a confidentiality or non-disclosure agreement acts as a deterrent. On the most basic level, the agreement is evidence that the parties to the agreement had some sort of relationship where potential "trade secrets" about a business were exchanged. A properly drafted and executed confidentiality agreement serves to deter third-parties from "stealing" your business idea by effectively pointing out that, if they try to steal your idea, they can and will get sued and that you will have good evidence to show that the trade secrets behind the business came from you. Additional considerations include proper corporate due diligence. Aside from the IP-heavy protection mechanisms outlined above, there is also no substitute for following basic business formalities. These include proper entity incorporation, partnership or shareholder agreements to outline rights and responsibilities between partners and investors, employment agreements, web development agreements, and a host of other contractual protections which can and should be used in any third-party business relationship.